← Socola sisters: the new Lucy & Ethel? When we travel, we like to check out the local chocolate scene. On our first chocolate search in the DC area last year, we found a fun place for hot chocolate. 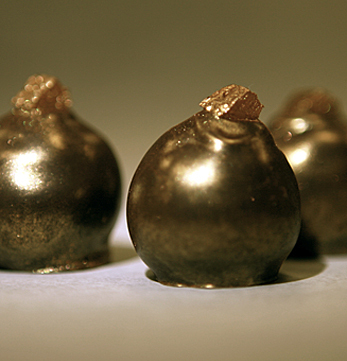 This year, we found truffles so delicious we recommend you seek them out. Our first stop was in Bethesda, MD at Cacao: Popular place. When we stopped by the week before Christmas, the display cases were pretty decimated. The staff was helpful, making recommendations of what was left, and we got a box of 4 molded chocolates: Coconut, passion fruit/apricot, and blackberry caramel in dark chocolate, and walnut in milk chocolate. 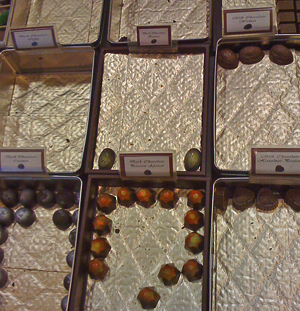 Nearly empty cases speak to a successful holiday season at Cacao Fine European Chocolates & Pastries. We liked the chocolate — very fresh tasting — but found the fillings too sweet overall. This was a common theme this trip, so it might be a regional preference for sweeter chocolates. 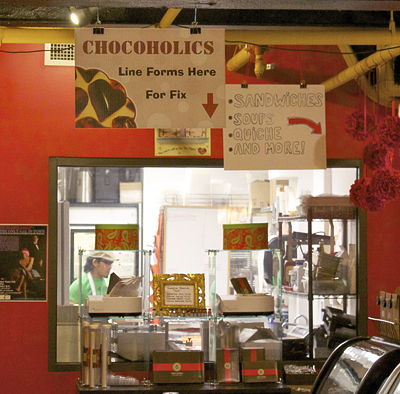 Cacao has 2 locations: 3508 Connecticut Ave. NW (Cleveland Park) and 7129 Bethesda Lane in Bethesda. UPDATE: Dec. 2011, Cacao has closed. We next visited Periwinkle Gifts, 3815 Livingston St. NW, which carries a lot of imported chocolates. Asking about local chocolate got us a bit of attitude from the sales staff, reminding us that on the last trip to DC, surly service never meant superior chocolate. This rule continues to be true. We managed to buy some local chocolates, but nothing to recommend. I suspect they were too long in the case. I’d brought my mom along on this day’s chocolate adventure, so I was hoping it would get fun. Thankfully, our next stop was Krön Chocolatier, which we liked so much it gets its own article. If you only want to try one chocolate while you’re in DC, I recommend you get out to Mazza Gallerie and ask for the Budapest cream truffle at Krön. Tiny store with friendly, knowledgeable staff in downtown DC. 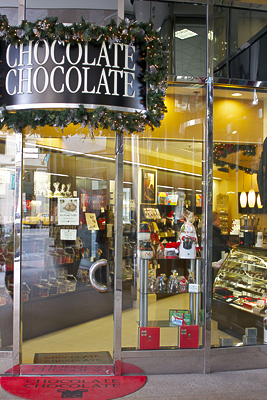 In downtown DC between Dupont Circle & Farragut Square, we visited Chocolate Chocolate, 1130 Connecticut Ave., NW. They carry mostly imported chocolates. The only local chocolate they carry is Naron of Baltimore, which makes old-fashioned chocolates. The sample I tried was too hard & sweet for me. They were selling truffles they’d made themselves, so we got some of those. They dip their ganache in Valrhona French chocolate and dust it with Scharffenberger cocoa powder, so except for the ganache tasting like caramel (again too sweet), these were pretty good. I’d like to check back with them and see how they develop their own brand. Our last stop was the DC location of ACKC, 1529C 14th St. NW (Shaw), whose Alexandria, VA location we enjoyed so much on our last trip. UPDATE 5/2012: This location has closed. ACKC: The place to queue for hot chocolate in DC. We’d saved this for last so we could enjoy their hot chocolate, which are all named for famous divas. Ronnie had the Joan Crawford, dark chocolate with espresso. Mom had the Eartha Kitt, dark chocolate with toffee. And I had the Rita Hayworth, dark chocolate flavored with clove, orange & caramel, another winner. We’re not the only ones who think ACKC hot chocolate is special: Travel + Leisure named it one of the best hot chocolates in the country. And their spaces are comfy fun with the owner’s artwork decorating all the surfaces, even the tables. When it’s busy, the steamed milk wand goes practically non-stop — a modern-day version of steam-powered industry. The DC location of ACKC is where they make their artisan chocolates, many of which duplicate the flavors in their hot chocolates, so if you can’t drink it now, you can eat it later. They also have other unique flavors like the Brie with toasted sesame seeds, which is an unusually tasty chocolate if you like cheese. The staff is friendly and knowledgeable, which as we know by now means you can enjoy your purchases both in the store and later. Date posted: January 12, 2011. This entry was posted in American chocolate, Chocolate around the World, Outside the Bay Area, Review and tagged ACKC, almond, apricot, artisan, Bethesda, blackberry, Blue Moon, brie, Cacao, caramel, Chocolate Chocolate, chocolatier, clove, coconut, cognac, dark chocolate, DC, drinking chocolate, espresso, hot chocolate, Krön, orange, passion fruit, pistachio, sesame, souvenir, toffee, Travel +Leisure, truffle, truffles, walnut, Wanders, Washington, Zöe's. Bookmark the permalink.